← Let the Easter Bunny Motivate You To Move! I Need YOU to Help Me Re-Unite with Sue and all the other Walkers in October! Is it me, or do these Motivation Mondays seem to arrive faster and faster? I can hardly believe we’re already done celebrating Easter and Passover and for many others, spring break 2015 is a happy memory, as well. With time flying by so quickly, I hope you won’t mind this early call for support as I try to make my way to the finish line of my second Avon Walk to end breast cancer. The 39.3 mile journey takes place here in New York City in six months. 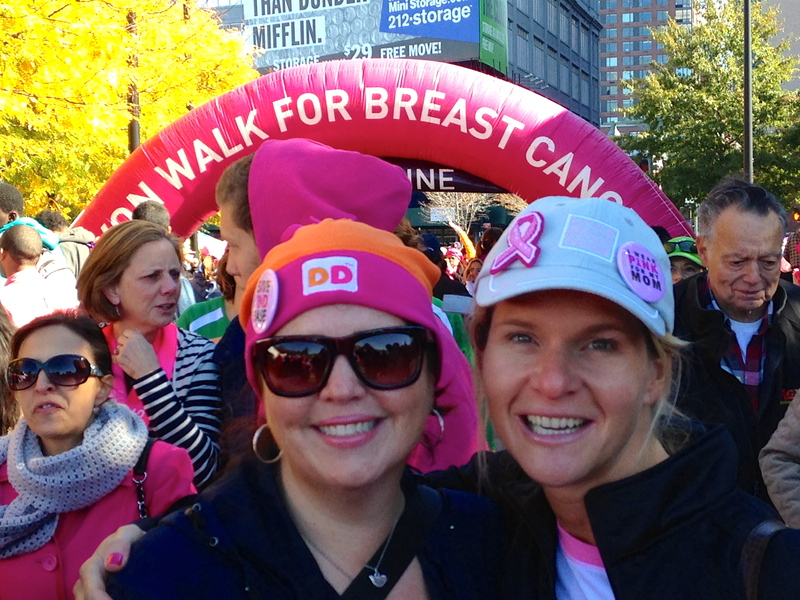 As you longtime readers may recall, my experience in last year’s Walk was truly life-changing. (Click here for a re-cap of what made the weekend so special.) My goal this year is to re-unite with fellow St. Mary’s Gael Sue and hopefully encourage other classmates, friends and family to put their best feet forward, too! It’s simple. The more people who walk, the more money we raise and the better our chances of wiping breast cancer off the planet once and for all. While I look forward to participating in as many Walks as possible in the years ahead, it would be absolutely amazing to know the event became obsolete in my lifetime because doctors and researchers found a cure. Before I walk a second time for my mom who beat breast cancer in 2008 and two women my age who went through hell and back to battle the disease during this past year, I need your support. Each walker needs to raise a minimum of $1,800 to lace up. No donation is too small. Just think, if you donate early, you can consider it a good deed crossed off your list for spring. The link below will take you to my personal page on the Avon39.org website. You can make a donation online, or if you’d rather mail something in, email me and I’ll gladly send you the paperwork. I thank you ahead of time for your support, not only for the Walk, but for all my efforts aimed at helping others have fun, be fit and feel fabulous! Posted on April 13, 2015, in Fitness, Health and tagged Avon 39, Avon Walk to End Breast Cancer, Donations, Motivation Monday, Personal Fitness. Bookmark the permalink. Leave a comment.